Our journey begins with using Magnet Axiom (thanks Jessica!) in an attempt to acquire data, and subsequently process that data, from a stock Android device. Following the very concise, user-friendly prompts, all of the steps were properly taken in an effort to acquire the device. However, the first issue arose when the "Trust this computer" prompt never came up on the Aristo itself. Since I've had many experiences with mobile devices in the past, my first thought was to fire up Android Debug Bridge (adb) in an attempt to make sure that adb was properly recognizing the device. Because if adb can't recognize it, acquisition through just about any commercial tool just won't work. Interestingly, choosing the "Charging only" option from the USB option in Developer mode, which is usually the standard in Android device acquisition, results in nothing being recognized in adb. So, the next step is to see if perhaps we connect with MTP (Media Transfer Protocol), it will allow adb to recognize the device. It is a different protocol, and I know from past experience that sometimes different protocols means the difference between working or not. 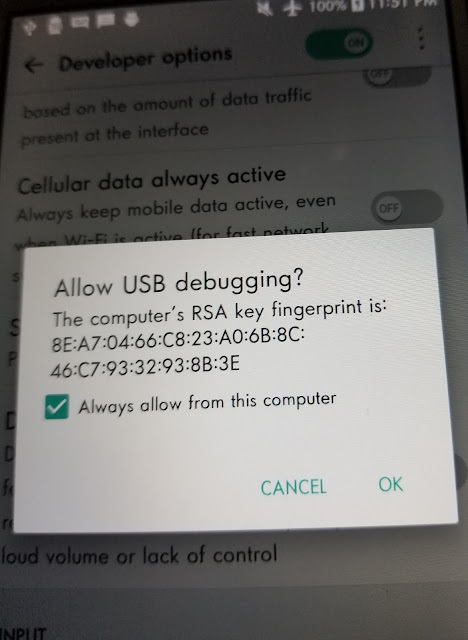 When I chose MTP from the Developer Options, I was *finally* presented with the desired "Allow USB debugging" prompt, which also lists the unique computer fingerprint. So...success!! Finally, debugging options show up on the device with MTP! Or not. adb recognizes the device and allows me to send commands, such as making a backup, but what I need is the Magnet agent to be pushed to the device so we can get the user data, such as SMS, contacts, call history, etc. 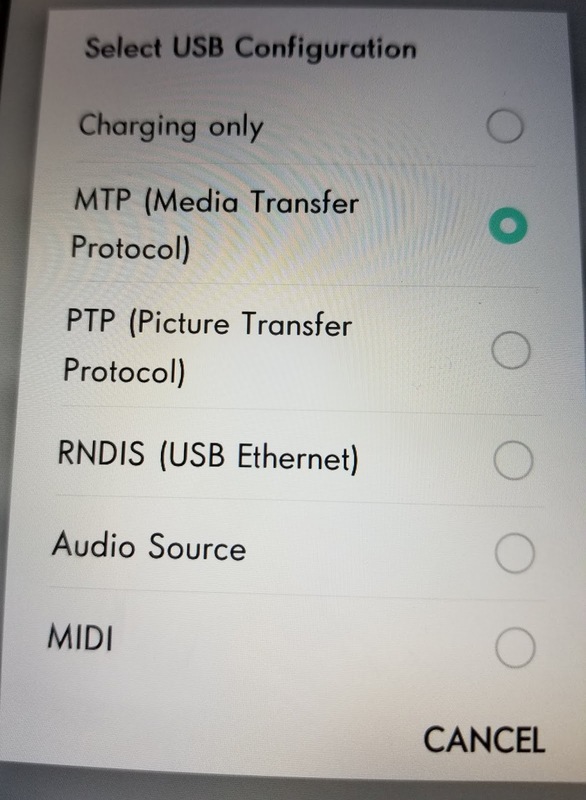 When connected via MTP, it seems the Aristo allows some data to be transferred from the device to a system, but it does not allow data to go from the system to the mobile device. Curses!! Foiled again!! 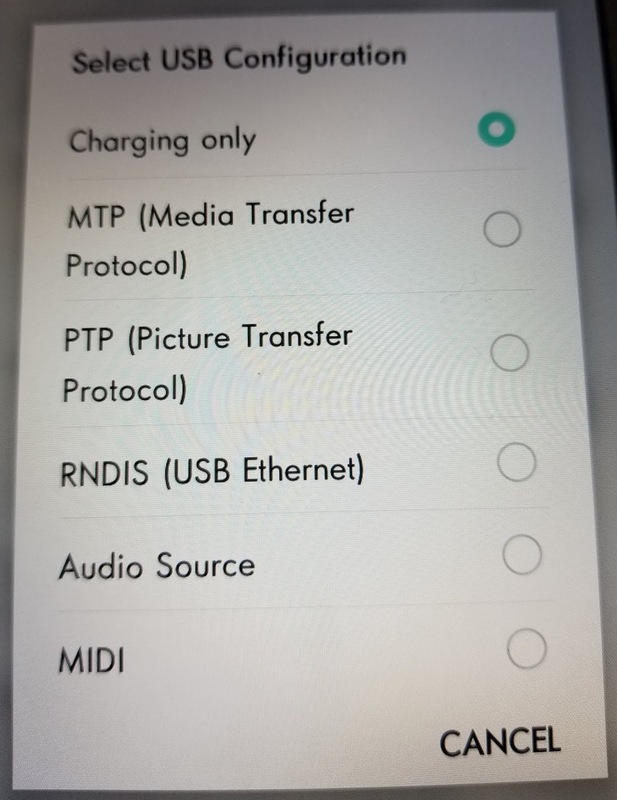 abd recognizes the device with MTP. Partial success! After deliberating, some adb-kung-fu, and using Google to search for additional options, I decided to try using PTP (Picture Transfer Protocol). 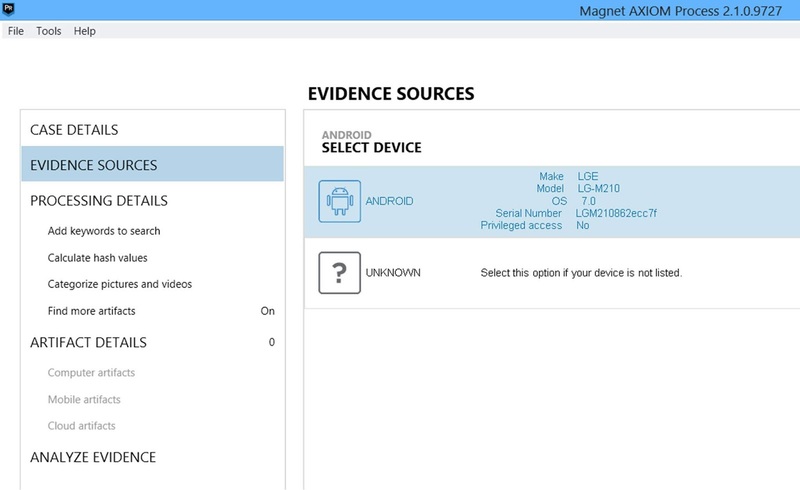 adb still recognized the device, however, for reasons that COMPLETELY elude me, setting it up this way allowed not only the backup to be performed, but ALSO allowed data (aka the Magnet agent) to be pushed to the device! At last, I finally had success! Now we choose the PTP option. For some reason, this choice works!! Finally! With the PTP connection, AXIOM recognizes the device! Data acquisition as begun at last! Our data has been acquired! Interestingly enough, however, when I completely cleared the Trusted Devices on the mobile device, I could not get the "Trust Connections from this device" prompt to show up using a PTP connection. So, as long as you follow the method below, you *may* be able to get data from a severely locked down mobile device! 0) Get familiar with using adb from the command line. It is a free download, and most commercial tools use adb behind the scenes. If you do any work with Android devices, you should know some basics of adb! 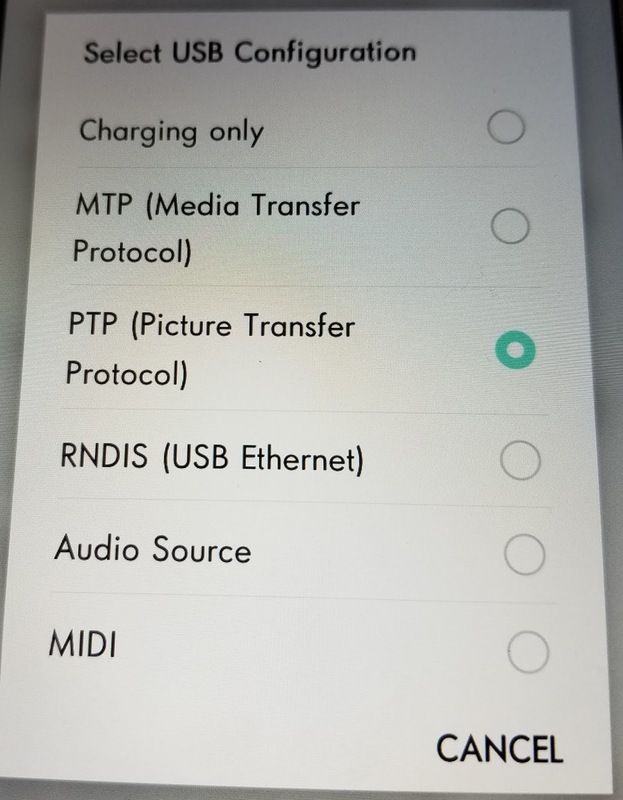 1) Connect the device using the MTP protocol. 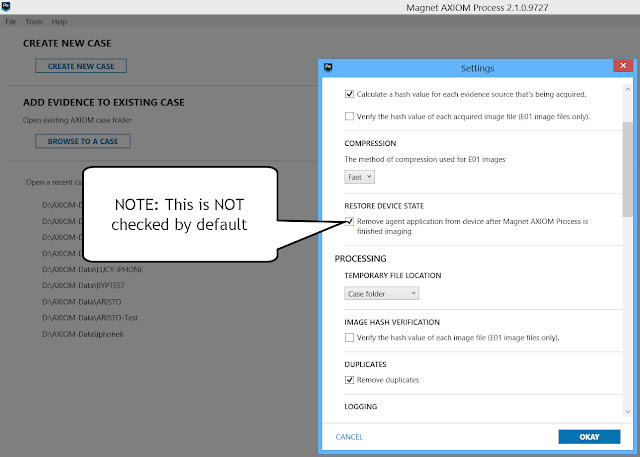 One additional note I would like to add about the Magnet agent when using Magnet Axiom to acquire data from a device. 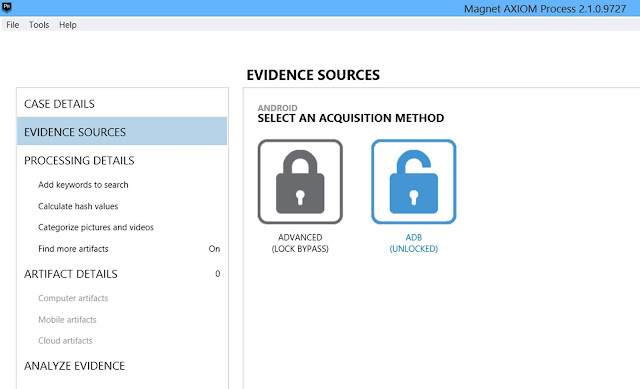 In my opinion, it is very important to choose the "Remove agent from device upon completion" option, found under Settings, when acquiring data from a mobile device. We ran into this issue with the agent being left behind when processing mobile devices during forward deployments. When we had devices associated with high value entities, the final step in data acquisition was that we would have to interact with the device and manually remove the agent and acquisition log(s). (NOTE: it was not Magnet, as they did not exist at the time, it was another vendor who I will not publicly name.) It is entirely up to the end user if they feel comfortable leaving behind an agent or not. I definitely do not and will always choose to remove it. I just wanted to specifically point that out to anyone using Axiom to get data from mobile devices!